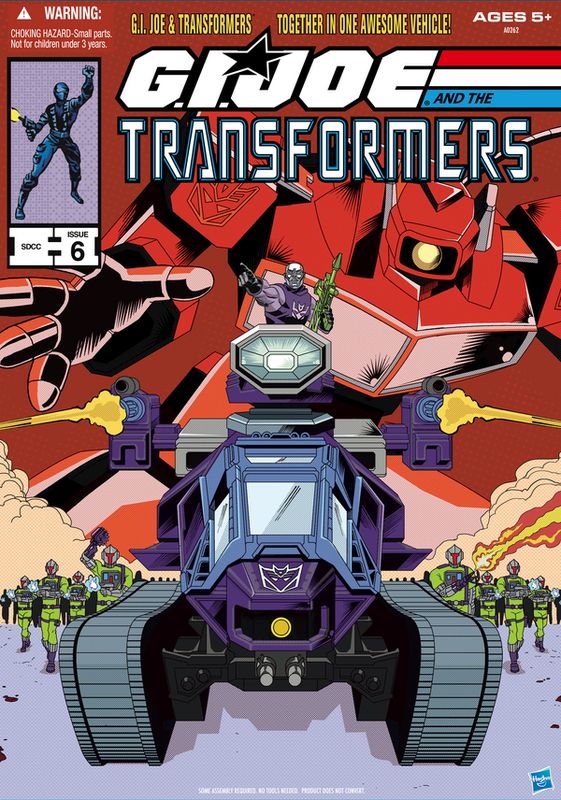 Ok, I am rarely blown away by the color composition of a toy. 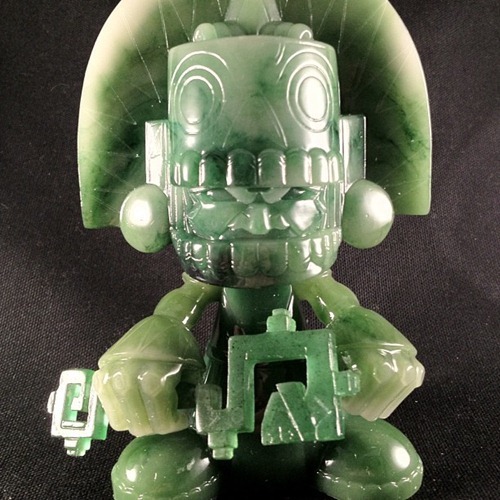 Usually it's the design that gets me hooked, but with this guy I am completely smitten with the jade finish. 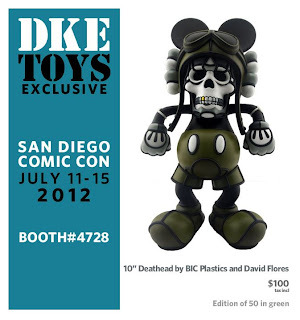 This is a resin version of Jesse Hernandez's Mictlan figure and is an exclusive for Kuso Vinyl at San Diego Comic Con. 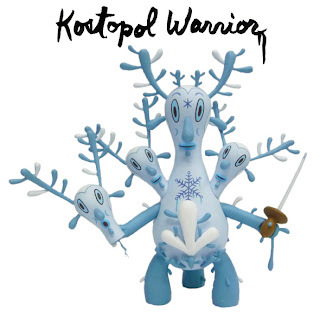 Only 25 of these beautiful figures were made and they will cost $150 each. I don't know who did the casting on these but it is mind blowing how close to jade this looks. 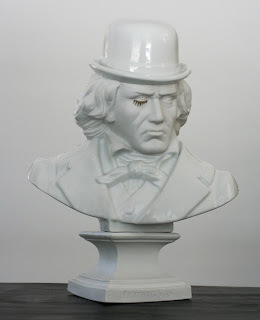 Keeping that green theme going, this is the Absinthe version of Doktor A's Chester Runcorn. Only 100 pieces of this figure paying tribute to the green fairy exist and can be owned for only $65. Sugar cube not included. 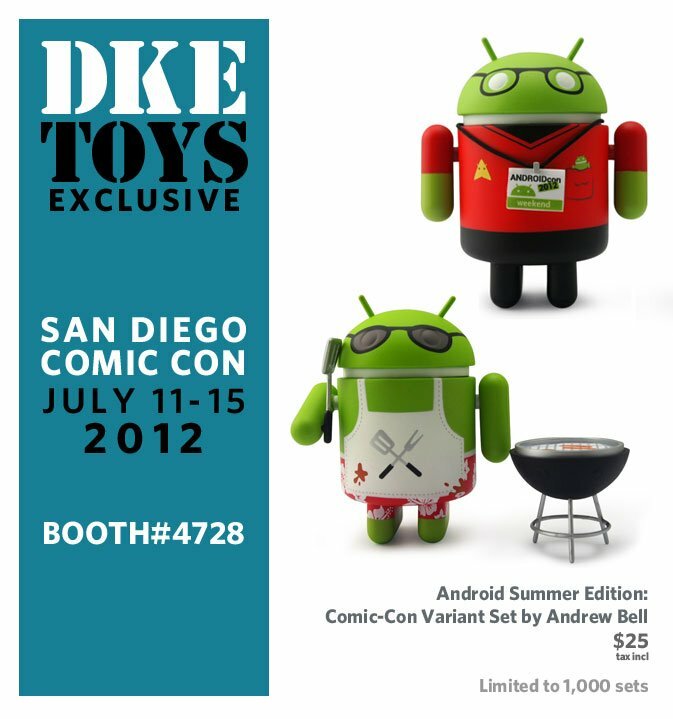 If you're going to Comic Con make sure to pay a visit to Kuso to snag up these exclusives. 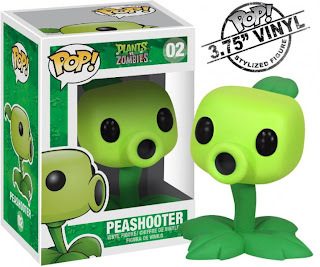 I got an email about this today and supposedly there is a toy in the picture above. 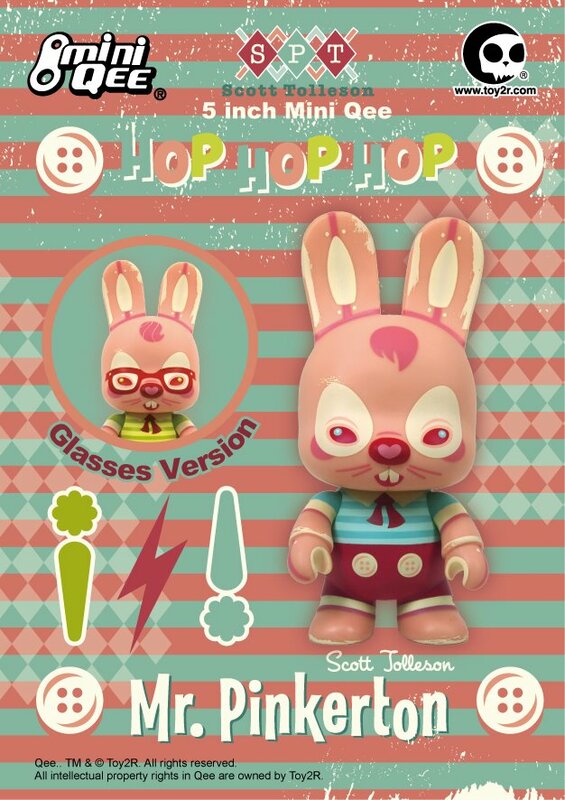 The info said it was the last version of Nathan Hamil's Belicose Bunny and it's an exclusive for 3DRetro at San Diego Comic Con. 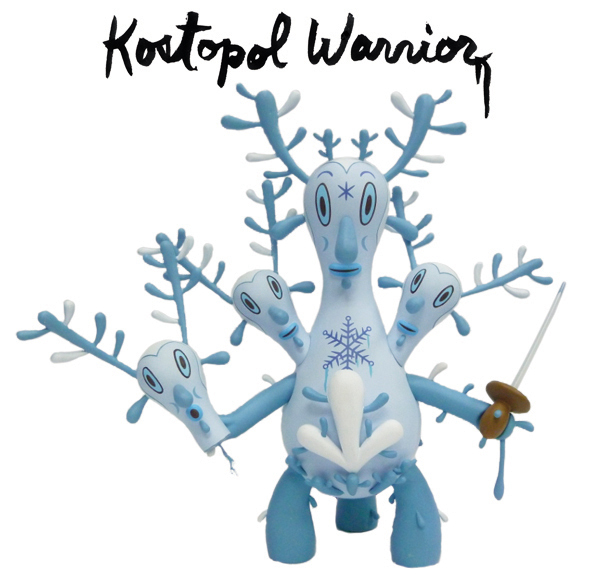 This Vortex version is limited to 120 pieces and will sell for $49.95 at their booth that they're sharing with Frank Kozik. 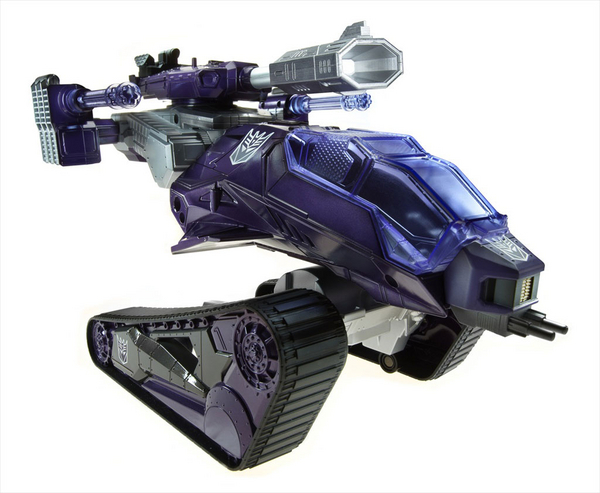 Thank God I've seen this toy in the past, so that way I can safely assume that this version is equally as cool. 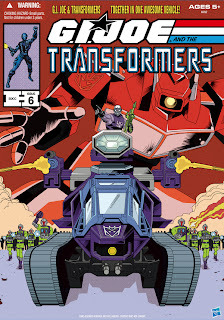 This is like the most sadistic version of "Where's Waldo" I've ever seen. Do you have a baby grand piano that just looks a bit naked? Do you have a parlor where you hatch your most evil of deeds? Even if you said no to both of those questions, you still need one of these. 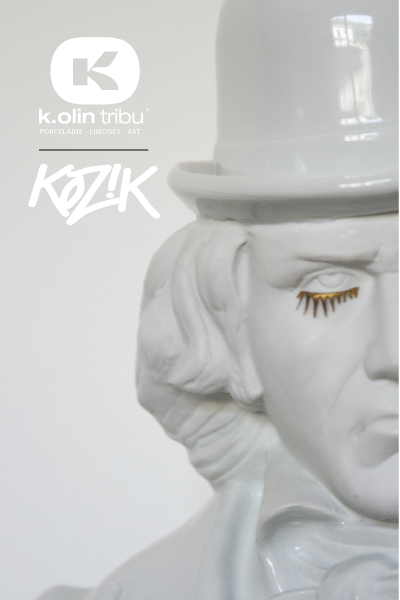 This porcelain beauty is from Kozik and K.Olin Tribu. I'm not even gonna tell you how much it costs, just know that I've owned cars that cost less. But if I had some serious cash lying around, or a credit card with a low interest rate, you better believe I'd have one of these. 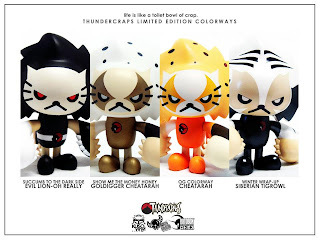 Only 15 of them exist in the entire world and you will be able to snag one one today by going to http://www.artandtoys.com/. Well I decided this would be a fitting thing to write about since the new Lego Batman game has turned me into a television worshiping hermit that could really use a long shower. Not that you needed to know that last part, but it gives you an idea of the addictive properties of this game. I need rehab. 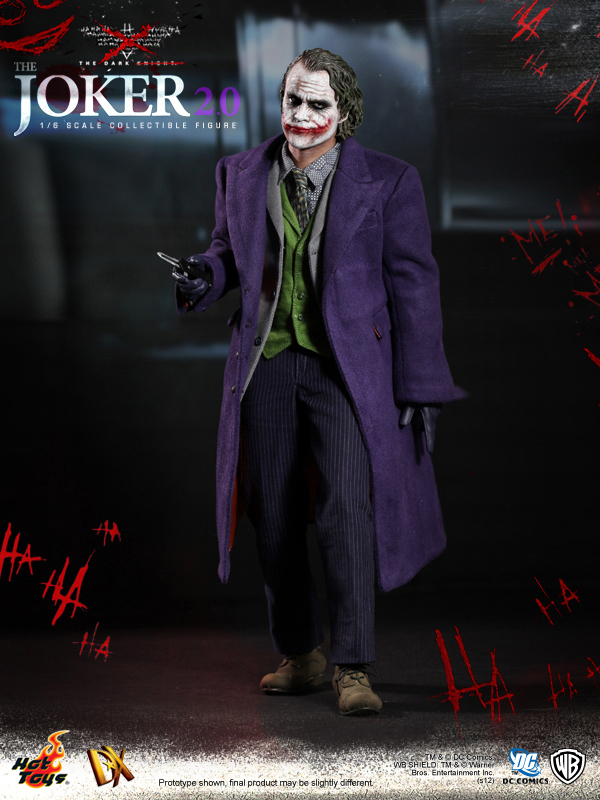 This is the Joker 2.0 figure from Hot Toys. 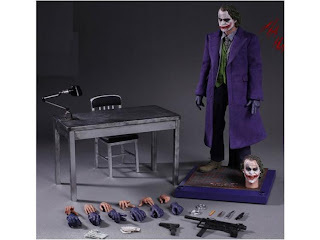 As you can see from the picture below he comes with 2 different heads, an assortment of hands, guns, and the interview room table from the film. This creepy clown is available for preorder at a ton of different places right now and will set you back $274. It should be available sometime around the end of the year. Now if he could only help me find all the mini kit pieces from the game. 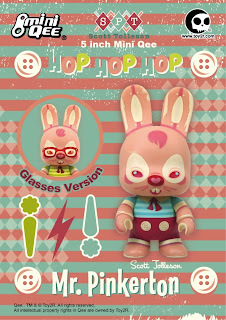 Anyone who is remotely into custom toys knows the name Rsin. 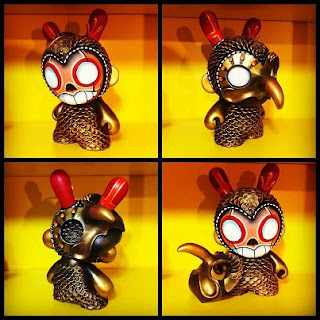 This guy has been transforming regular toys into sick works of art for years. This is one of his latest pieces and will be available at Dragatomi's booth at San Diego Comic Con. My favorite part of this toy is the plague mask, which is a great addition to what was an already amazing toy. 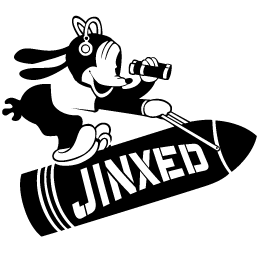 If you can't make it out to California next month you'll have another chance to see Rsin's work up close as he will be one of the artist's participating in a custom show I put together with Jinxed in Philadelphia. 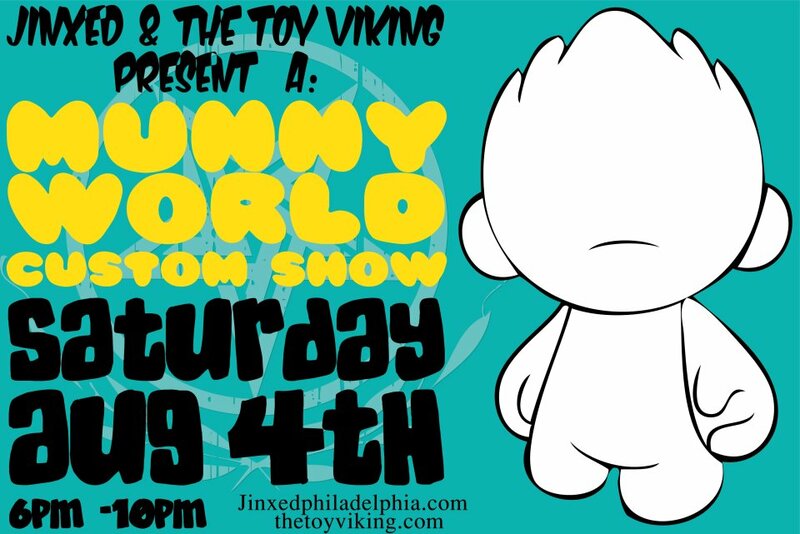 The show will be August 4th and will feature some great talent from the toy world and beyond. I'll let you know more in the coming days. Oooooooooh. 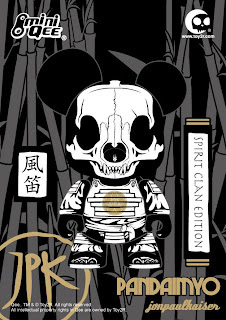 Ok, I thought I was in love with the first panda Qee that Jon-Paul Kaiser made, but now I know I'm totally obsessed with this one. I mean, this is full blown, "gonna stalk this toy in the bushes and write love poems about how happy I could make it" obsessed. It's so cool!!!!!!!! Toy2r has outdone themselves yet again with this guy. 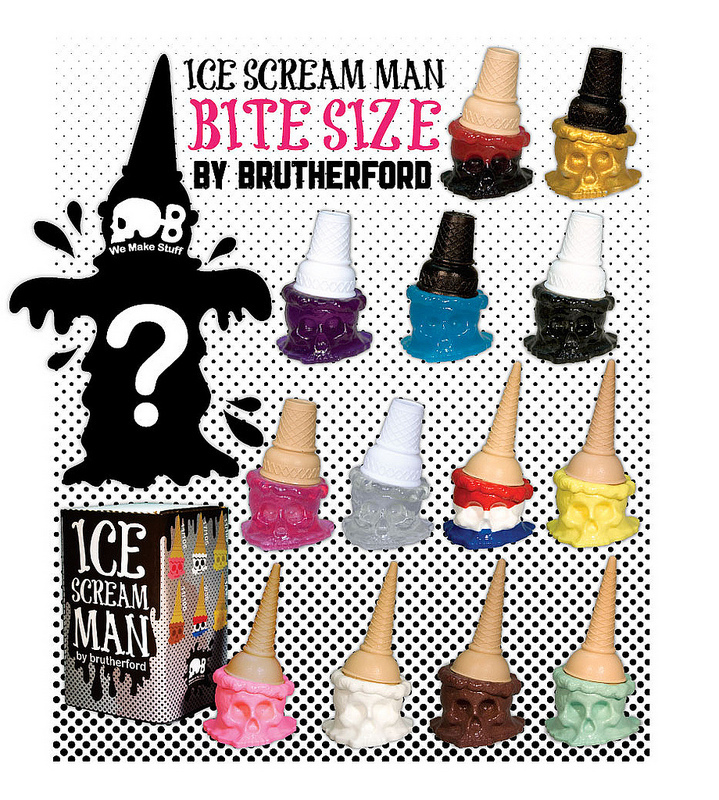 He'll be available in August for $28 and is ready to scare away all the evil spirits in your home. Or invite them in, it's really hard to say with something that merely has a skull for a head. 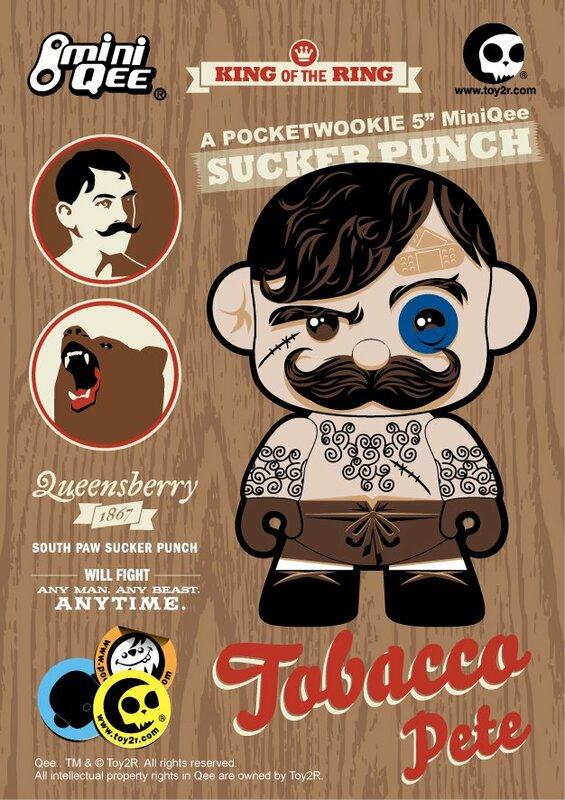 This is Tobacco Pete. If his wicked left doesn't get you the fabulousness of his mustache will. He hails from a time when men were men and bears were merely things you wrestled in the woods for sport. 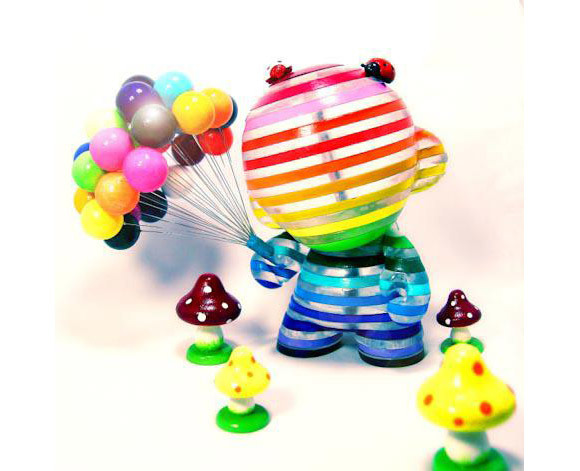 He is a Mini Qee designed by PocketWookie and produced by Toy2r. You can add him to your collection in August for a mere $28. He will then proceed to punch you in the face and steal your woman. You brought this on yourself. I saw this show once and it freaked me out a little bit. I imagine this is what it would be like to go to Disney World with Salvador Dali while doing acid. Or maybe this is what it's like when hockey players have had their 10th concussion. That being said, I don't know why I haven't watched more of this show, because I just made it sound delightful. Remember how I told you a few days ago that Mimobot has lost their minds and is releasing a ton of new products? 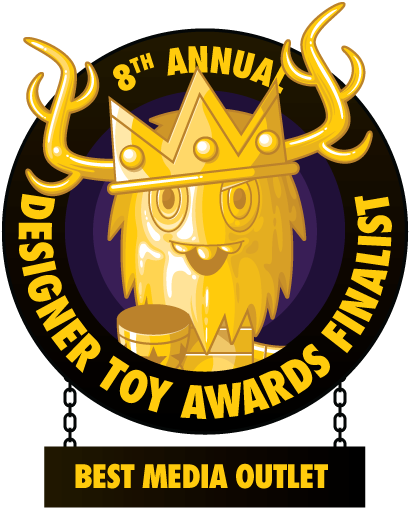 Well ta-da cause here's some more neat stuff from the kings and queens of flash drives. Adventure Time is the latest to get the Mimo treatment and you know you want them all. 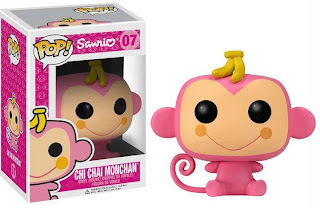 You can preorder Finn, Jake, and Princess Bubblegum right now, but you'll have to go to San Diego Comic Con to get Fiona. Time to find a toy mule me thinks. 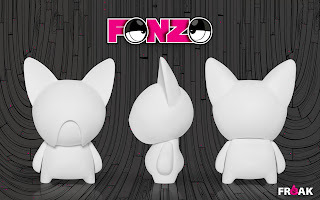 Gary Ham and Freak Store aren't content to rest with a mere two versions of their Fonzo figure. Now they want to see how you would interpret their cute little dog with this DIY version. 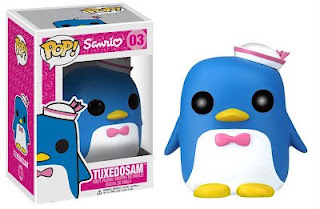 Paint him, glue him, put him in the microwave ( ok, don't do that cause I can't afford a lawsuit) so whatever it is you need to do to make him awesome. 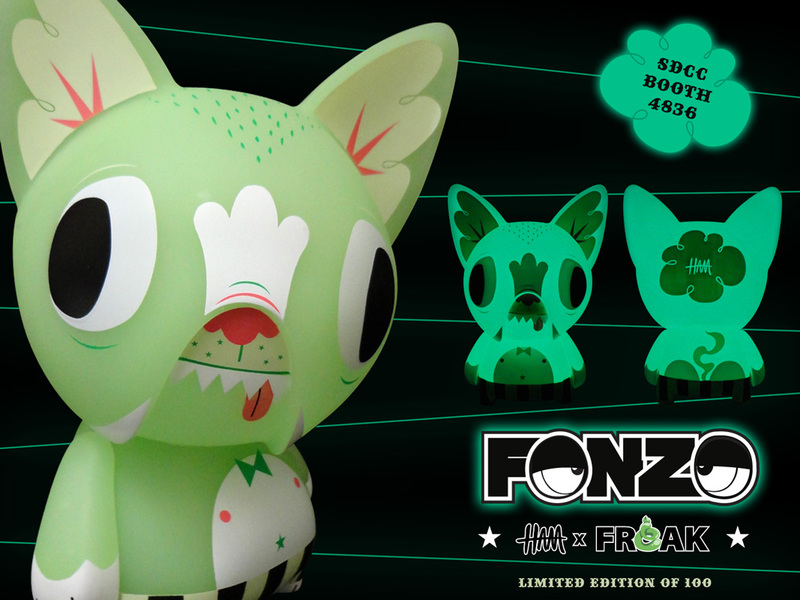 Those of you attending San Diego Comic Con will have a chance to pick up one of these uber rare glow in the dark Fonzos. Limited to only 100 pieces, this pup will be available from Gary Ham himself at his booth. Just the other day I showed you the unpainted version of Bevil, the newest creation from Paul Shih. 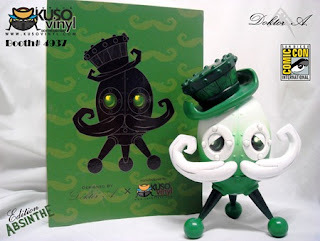 Now he is all decked out in green and ready to be shipped off to new homes all over the world. 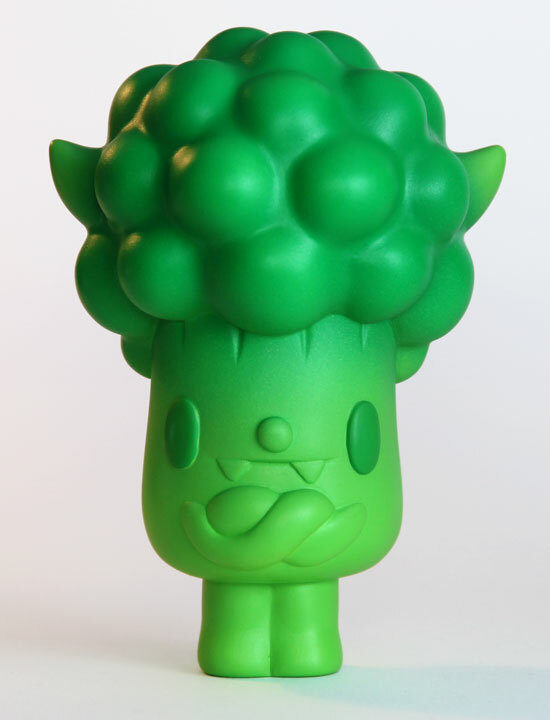 This Friday you can get your daily does of vegetables by ordering this mischievous broccoli. Only 15 of this guy have been made and will each come with a mini photo print. For $50 you can get your daily portion of vegetables, but I wouldn't try nibbling on this guy. For one, resin tastes like crap. And secondly, this guy looks like he may bite back. 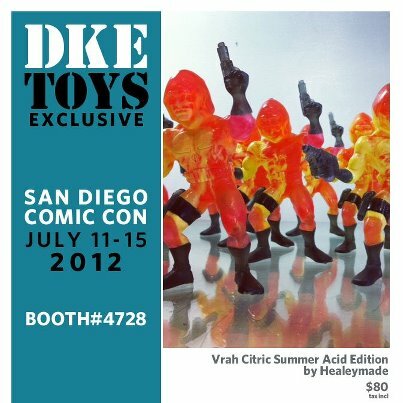 They go on sale at one Pacific time on June 22nd at http://paulshih.bigcartel.com/. 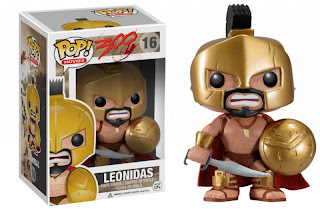 I could make the obvious joke about King Leonidas yelling "This is Sparta" and kicking all the Sanrio characters down a well, but that would be too easy. 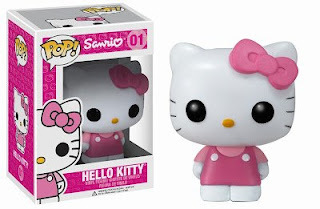 Plus my wife has already threatened my life if we don't get Hello Kitty and her brood, so I better be nice about them. These are the latest Pop! 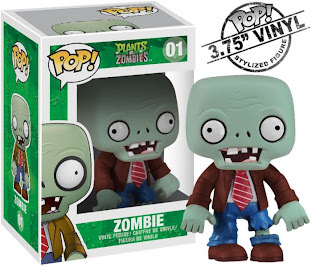 Vinyl figures from those productive folks at Funko. Look for Leonidas in July and the Hello Kitty characters in August. Oh mah Gawd. 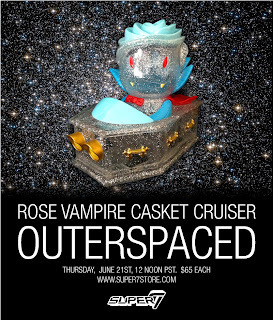 This new Rose Vampire looks like he's bee through one heck of a party with all that glitter. 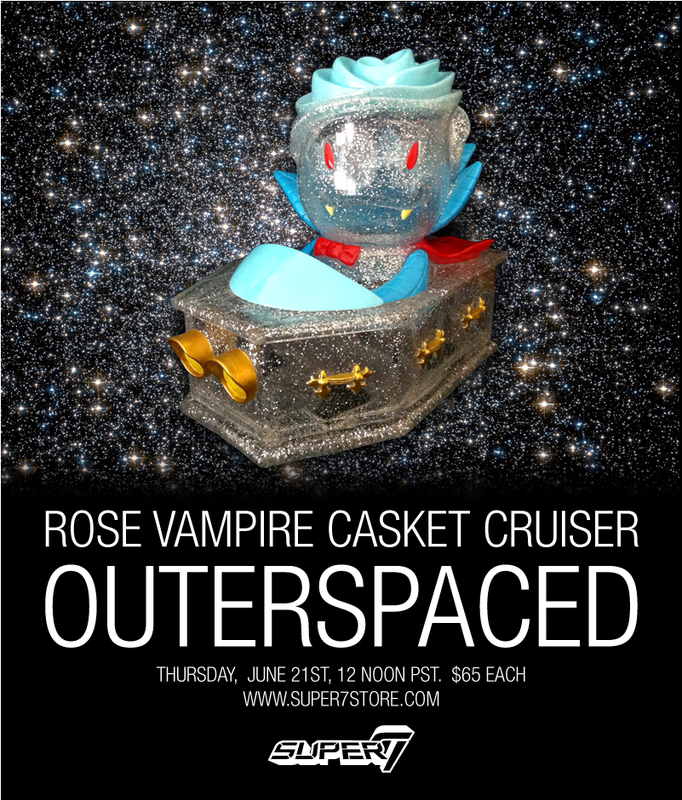 A space party put on by intergalactic hipsters that just want to rage out to Deadmau5 and talk about how "there will never be another night as awesome as this night". Super7 always kills it with everything they release but I am really loving the transparent glitter vinyl used in making this toy. Plus he's driving around in a coffin, which most kids dream about doing before adults come along and crush their imaginations. Keep the dream alive this Thursday, June 21st at noon Pacific time for $65. 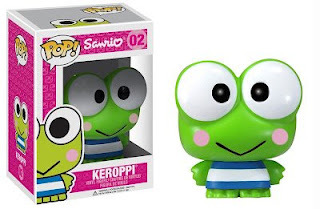 You know what I love about Pop! 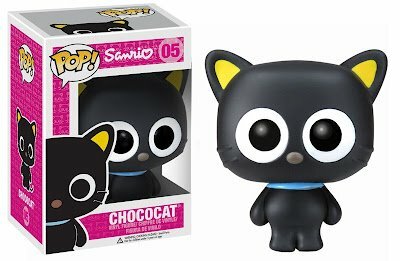 Vinyl figures from Funko? Well for one, they're awesome. For two, they're affordable. And for three, you stumble upon them at a ton of different stores so if you're ever going through toy withdrawal you can easily get your fix by picking up a few of these guys. 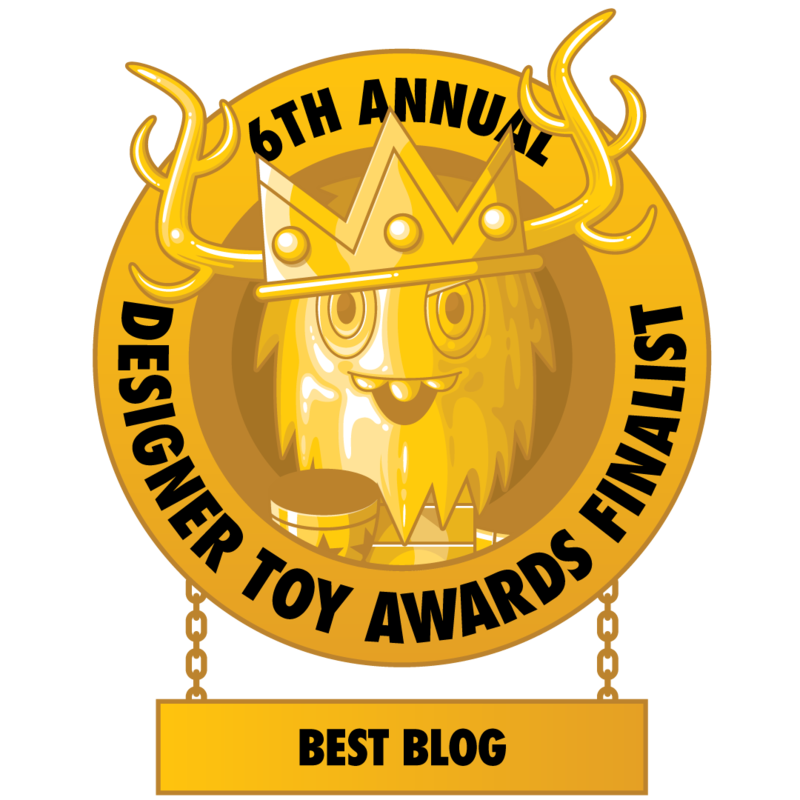 No one wants to go into convulsions from toy withdrawal, let me tell you. It's not pretty. These are some of the latest figures in the ever expanding Pop! Vinyl universe. It's Plants vs. Zombies!!!!!! See, now these are zombies I can be ok with, cause they don't look like they would drip all over the place. Seriously, I know people that are obsessed with zombies, but you'd never want a real zombie in your house. The eating your brins thing is a problem, but even worse is they would get their rotten goop on your funiture. And forget trying to eliminate the smell of some reanimated corpse hanging about. Your property value would free fall just cause you thought zombies were cool and wanted to be a weirdo about it and invite them to hang out. Now that "I Love Zombies" bumper sticker on your friend's Hyundai seems a bit silly now doesn't it? Guess what time it is? 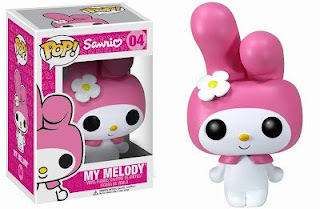 If you said something other than "new Dunny time" then I'm pretty mad at you. It's only one of the most important days of the year, next to Leif Ericson Day of course. And Bastille Day. But since neither one of those involve small plastic toys they are not nearly as exciting. No matter where you are in the world there is likely a store close to you that will be having a trading party. I'll be spending my June 21st at Jinxed in Philadelphia and if you're in the area you should too. If you're too far away I sort of understand if you can't make it, but not really. Get yourselves there and bring lots of stuff to trade. The Piazza at 2nd St. and Girard Ave.
My wife wants a rabbit. We have 3 cats but she's been obsessed with the idea of getting a bunny to go along with them. I'm not necessarily opposed to the idea, cause I love animals and all, but I know what's going to happen. She's gonna snuggle it and think it's cute and play with it and anything involved in actually keeping it alive is going to be my job. I clean up enough poop as it is now and I don't know how much more time I can dedicate to the bowel movements of fuzzy critters. 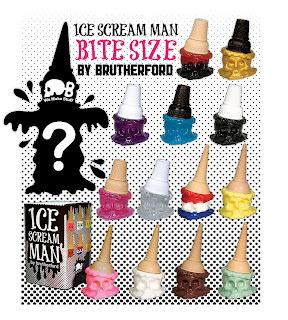 Maybe I can get her one of these guys instead. The cleanup certainly would be easier. 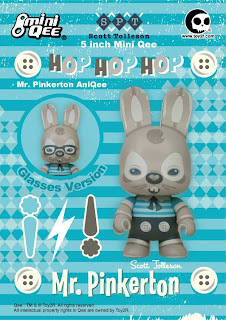 Scott Tolleson and Toy2r have joined forces to create these Mini Qees named Mr. Pinkerton. They come in two different color schemes, the option of having it with or without glasses, and features the classic American styling that Mr. Tolleson is famous for. 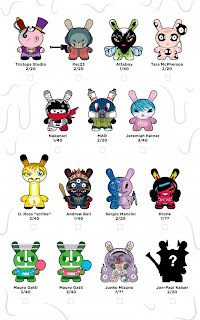 I would imagine they will be $28 each since most Mini Qees are priced that way. The blue one reminds me of Dennis the Menace. I feel old. Ok, I haven't been into sports figures since I was a wee little Viking who had a love of Starting Lineups. I still have every one of them that I ever owned and while they used to be worth quite a bit, they are now easily found at just about any Goodwill or flea market. If I were ever going to buy a sports figure again this would have to be it. 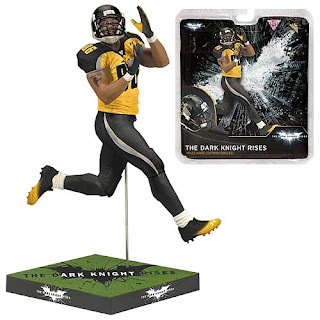 McFarlane Toys has created this figure of Hines Ward from his appearance in The Dark Knight Rises. He plays for the Gotham Rogues football team which has been featured prominently in the early trailers for the film. 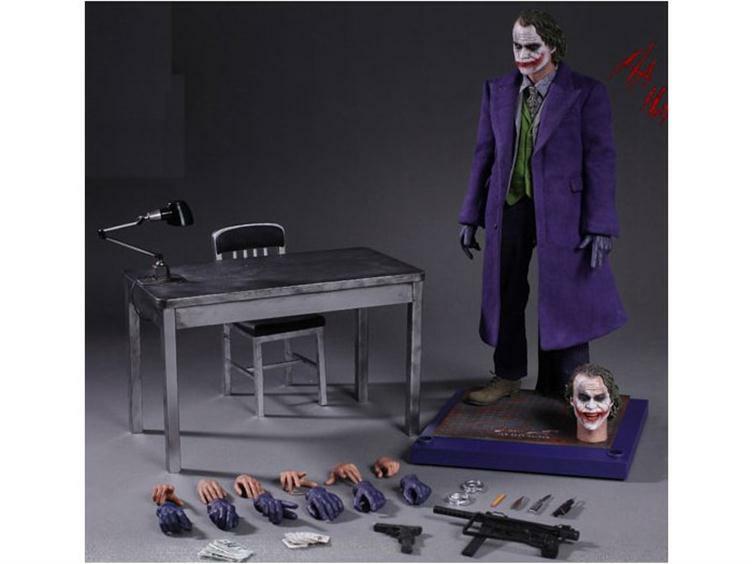 Available this October, it will retail for $12.99. Tickets are on sale right now for this years New York Comic Con and I wanted to do a little something because I am sooooooooooo looking forward to it. 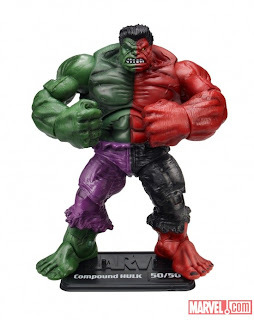 At last year's convention Hasbro had an exclusive red/green compound Hulk figure available and I just so happen to have saved one since then. It's been sitting in my office, unopened, begging to be given away, so let's do a contest. Follow me @TheToyViking on Twitter and tweet to me "Hulk Smash". 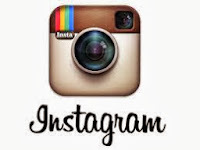 Don't have Twitter? Then follow me on Facebook and post on my wall the same phrase. One lucky winner will get this uber rare figure sent to them from me. You'll probably get some cat hair in the box as well because our little ones are shedding like crazy. But hey, bonus for you right? Don't forget to go to www.newyorkcomiccon.com right now and get your tickets to this show. I'll announce the winner next Friday so that way everyone has plenty of time to enter. Kidrobot has just announced the winners of its annual Munnyworld Custom Contest and there are some amazing pieces in this year's list of winners. I'm only featuring two of them because otherwise I would be here all day typing and probably get fired for not going to work. The figure above was created by KyoungWhan Oh from Suwon-City, South Korea and may look like a bunch of simple lines painted on the figure but is in fact much more complex than that. The figure was sliced into sections with some of them being painted and others being replaced by clear pieces that were identical to the originals. That is a sick amount of precision work and is one of the most original concepts I have ever seen. 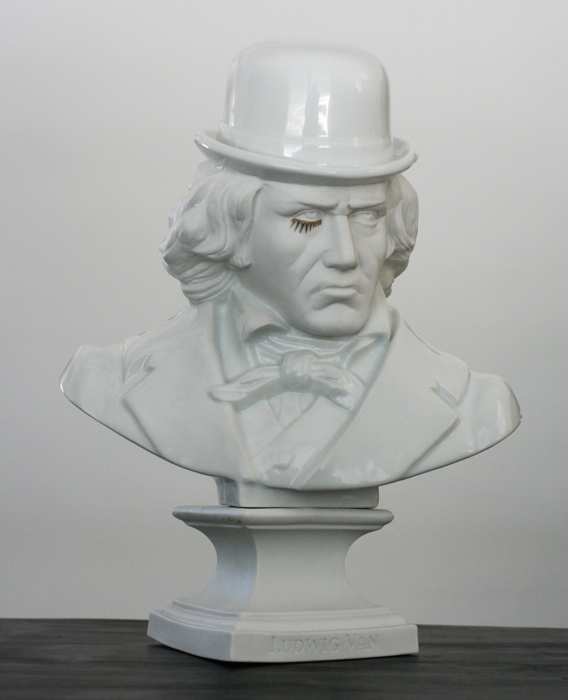 Needless to say, this piece was voted "Best in Show". 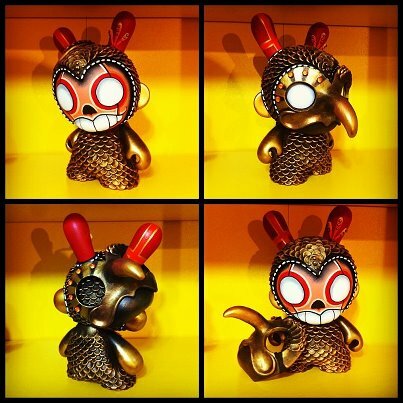 This piece is the work of artist Bjornik and was voted "Best Munny". I love his work and have featured it before so I was glad to see this among the winners. 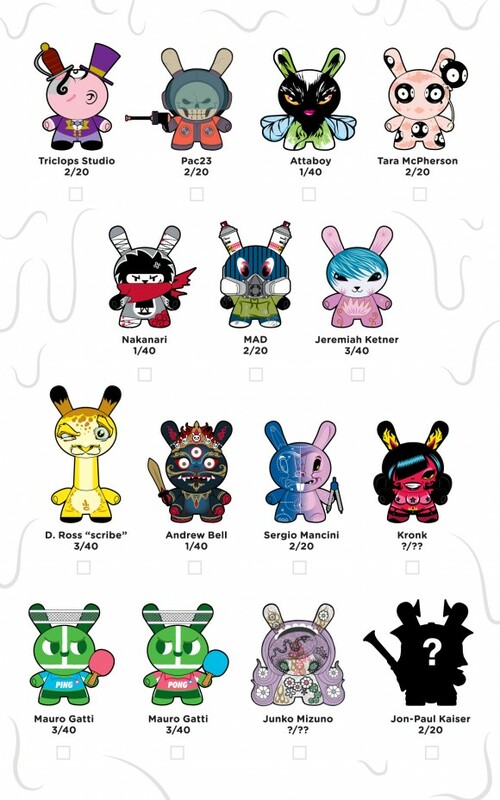 There are a ton of other custom toys to be seen by going to http://blog.kidrobot.com/the-new-champions-of-munnyworld/. Omg I love these!!!! These are The Thundercraps and they are better than anything you've ever seen before. Yes, Kuso Vinyl has released some of these before, but I never fail to get excited each time I see a new one. And if you're lucky enough to be attending the Anime Expo in Los Angeles in a few weeks, you can get a killer box set of them. Each box contains 3 figures and 1 out of every 3 boxes will contain the special "Goldigger" Cheatarah figure instead of the basic one. 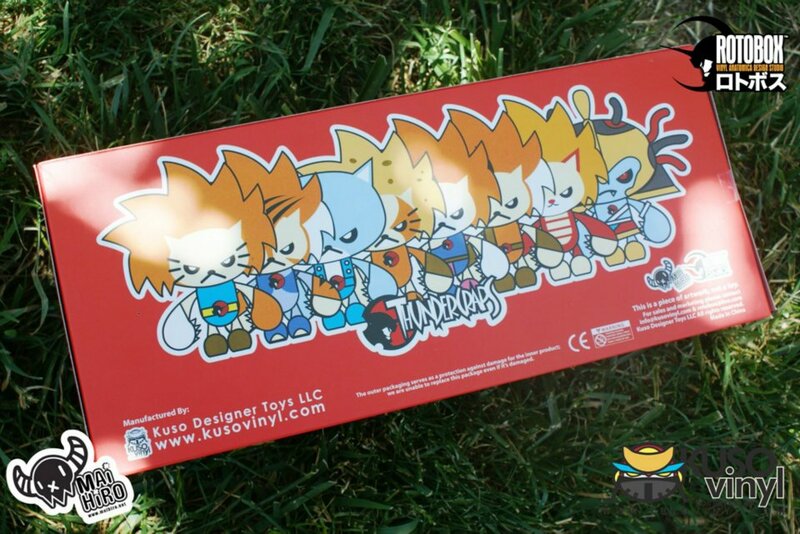 And check out the box they come in cause it looks like the future of the Thundercraps is filled with many more designs to come. I want them all in case you were wondering.